optional for serving: sesame seeds and Green onion, chopped. Stir cornstarch and water until combined, then pour into saucepan over medium heat. Add brown sugar, honey, soy sauce, vinegar, garlic, and ginger. Allow to simmer, whisking occasionally. Bring to a boil for 1 minute, then remove from heat. Place chopped onion and chicken into slow cooker. Pour teriyaki sauce on top. Cook on high for 3 hours or on low for 5 hours. 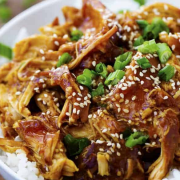 Remove the chicken from the slow cooker and, using 2 forks, shred into smaller pieces. Place back into the slow cooker and stir to combine. Cook for 1 more hour on low, stirring occasionally. Garnish with sesame seeds and scallion, if desired, serve on cooked rice, quinoa or with steamed vegetables.